As an extension of the Montana Preservation Alliance, "Hidden Helena Downtown Tour" we invite you on a new self-guided tour into some of the Helena Valley's most spectacular rural historic sites. Participants will explore homesteads, mountain towns, schoolhouses, and more. Read more . . . The Montana Preservation Alliance once again invites you on a self-guided tour inside some of the Queen City’s most famous historic buildings. Participants will pick up their maps and have four hours to explore secret passages, rooftop turrets, basements, and even Big Dorothy’ bathroom. Explore the history that speaks to you behind-the-scenes in Montana’s Capital City. Read more . . .
It’s the perfect time of year to make a hand-painted gift AND help preserve historic Montana! Registration is $18 per person, plus your pottery item fee, and includes a delicious catered dinner from Murry’s Cafe! The Painted Pot will generously donate a portion of the evenings proceeds to the MPA. Registration at Painted Pot is required. Call (406) 443-3799 to register or click here to purchase tickets online. Join MPA staff and board of directors for our annual holiday open house and annual meeting with holiday decorating and refreshments. We will also showcase some of our achievements from 2018, and elect new officers. Click the button below to vote for officers, Susan Henshaw Jones, Bob Ebinger, and H. Rafael Chacon. MPA invites you on a self-guided tour inside some of the Queen City’s hidden historic architectural gems. See everything from basements and rooftops, to historic homes and even, Big Dorothy’s bathroom. Follow the button below for details and tickets. Everyone is invited to join MPA for some serious stretching and/or casual beer drinking on Sunday, October 7th from 5 to 8 p.m. at the Ten Mile Creek Brewery, 48 N. Last Chance Gulch, Helena. Ten Mile is kindly hosting the Montana Preservation Alliance as part of their Brew A Better Community project. For every pint sold that evening $1 will be donated to our organization to help fund renovation and historic education projects all across the state. If you were planning to be in bed by 7 p.m. before another crazy week (first of all, we don’t blame you) but you still want to support the cause, you can join us at Ten Mile at 11 am for a yoga class taught by Loft Studio. The $10 fee gets you an hour yoga session, a pint of beer afterwards, and the warm-fuzzy feeling that $2 of your fee goes to our work. We're looking forward to a strong and thirsty turnout Sunday at the brewery! Eat lunch or dinner at Karmadillos on Friday, October 5 and they'll donate 25% of sales to MPA! Guac, ritas, tacos, enchiladas? What a great way to raise money for preservation! To seal the deal, we've added a special, FREE Reeder's Alley Haunted History tour at 5:30 pm. Join MPA and historian Ellen Baumler, Helena's haunted history expert, at the Pioneer Cabin to take an informative and spine-tingling tour of ghostly Reeder's Alley history, with stops inside the Pioneer Cabin, Ms. Baumler's very own haunted office, and inside the old Stonehouse restaurant. Afterwards, shake off your goosebumps with some guacamole and margaritas at Karmadillos Southwestern Cafe at the top of the alley. Bring the whole family to this spooky, scrumptious Helena event. There's no question that beer benefits Montanans everyday, so please make time to join MPA staff, Board, and friends at Blackfoot River Brewing in Helena for beer and conversation on Monday, September 10 from 5 pm to 8 pm. For each beer sold, Blackfoot River will generously donate $1 to our preservation efforts all across the state. MPA Executive Director, Chere Jiusto addressing the award winners and conference attendees before the Preservation Excellence Awards Luncheon. 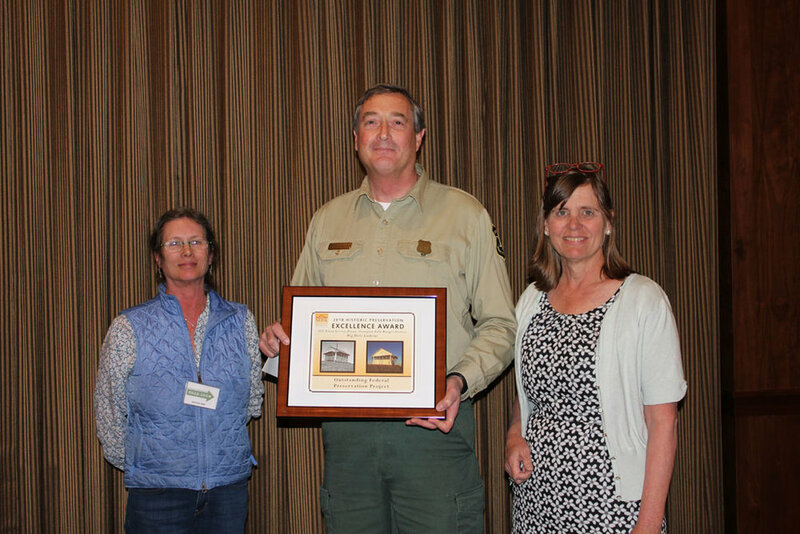 David Hattis of the Plains Thompson Falls Ranger District accepting the Outstanding Federal Preservation Project Award for the Big Hole Restoration Project alongside Stephanie Ambrose-Tubbs and Chere Jiusto. John & Stephanie Hekkel accepting the Outstanding Commercial Restoration Award for their work on the Club Moderne. The Montana Preservation Alliance (MPA) is delighted to announce the recipients of our 2018 Historic Preservation Excellence Awards. 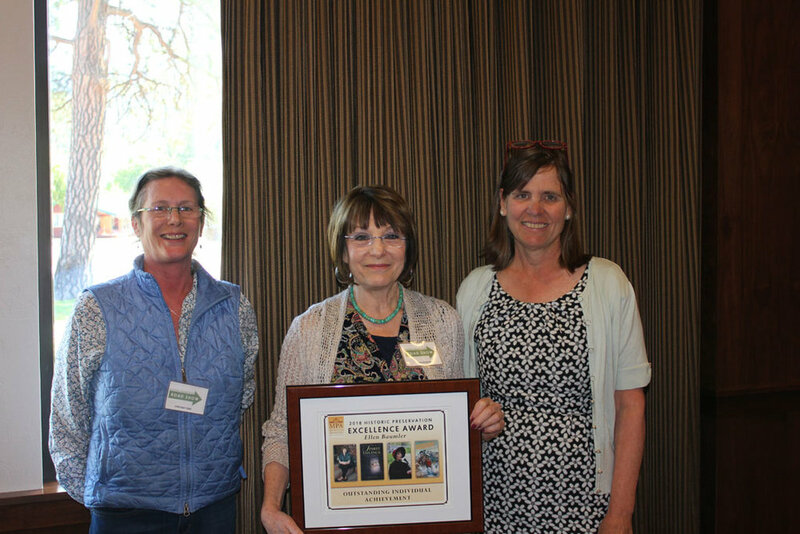 The Unsung Heroes Awards Luncheon to celebrate the honorees will take place during the Montana Preservation Road Show at the Cedar Creek Lodge in Columbia Falls at Noon on Friday, June 15. The event is sponsored by JVA Engineers. Since 2001, MPA has celebrated individuals who have made an outstanding effort to save and protect Montana’s special historic buildings and places. Not only do we applaud good stewards and advocates for heritage properties, we also promote the importance of historic preservation as a tool for economic development, community vitality, and increased tourism. As we commend these outstanding efforts to preserve Montana, we further our mission to preserve historic places, traditional landscapes, and cultural heritage. This year’s group of honorees is wide ranging in their accomplishments and impressive in their creative vision and tireless efforts to keep history alive. In honoring their achievements, we hope to inspire others and encourage a host of new preservation projects. And the honorees are . . .
Ellen Baumler retires this year as the interpretive historian for the Montana Historical Society, a role she has served in for over 25 years. Since 1992, when she took on the Montana Historical Society’s National Register sign program she has written the text for hundreds of interpretive signs, written dozens of National Register nominations, created walking tours and school educational units, and published papers on various aspects of Montana history. She is the author of seven books on ghosts and haunted places in Montana, and is a fixture each year in Reeder’s Alley, giving tours of the Pioneer cabin and the old stone house, and bringing to life the early history of Helena for scores of elementary school kids. In many ways, she has been an ambassador of history for the Montana Historical Society and has brought much needed attention to underserved topics that resonate with the public including haunted places, red light ladies, and ethnic settlements. She has carried her love of history over the airwaves too, with her radio programs “History on the Go” and her blog, Montana Moments. Ellen has been called a “rock star of history,” a title she is happy to claim in honor of her love of historical places and her long standing commitment to telling the stories of our past in ways that make history accessible to all. The Big Hole Lookout Restoration project was a multi-year group effort led by Erika Karuzas at the Plains Thompson Falls Ranger District. The Big Hole Lookout is a simple log-cabin style lookout with windows on all sides, built in 1930 and used until 1971. By 2013, 40 years of deferred maintenance was starting to show, but thanks to a dedicated group of lookout huggers, the Big Hole was given a new lease on life. Starting in 2013, Ms. Karuzas put together an army of volunteers and Forest Service staff to get the job done. Help came from the Forest Service Region 1 Passport in Time (PIT) volunteers, as well as the Region 1 preservation team and pack string, Wild Horse Plains Backcountry Horsemen (BCH) and the Sanders County Youth Conservation Corps. Over three years, rotting log walls were replaced in kind with new logs, all 19 windows were removed, repaired, and repainted, and the outhouse restored. All involved held their breath in 2016, when the Copper King Wildfire started on July 31st. The crew said their farewells, and hiked down not knowing if they would ever see Big Hole again. Luckily, Plains Thompson Falls District fire staff were able to quickly install structure wrap on Big Hole Lookout, and it survived the fire. After one more year of work the lookout was finally complete, and ready for public use. The Big Hole Lookout restoration project is a great example of many partners coming together to rescue a distinctive part of Montana’s forest history, making it vibrant, and useful to the public for many years to come. The Club Moderne has served as one of the most illustrious watering holes in Montana since October 1937, when Anaconda bartender John “Skinny” Francisco, decided to build a new club at the corner of East Park and Ash Streets. Francisco spared no expense in erecting the most fashionable, sleek, and swank drinking establishment for miles. What he built, is now recognized as one of the most intact and striking examples of Streamlined Moderne architecture and design in Montana and the Northern Rockies. The Club Moderne was listed in the National Register of Historic Places in 1986 and is a contributing resource within the Butte-Walkerville-Anaconda Historic District National Historic Landmark. A landmark renowned far beyond Montana, the Club Moderne was voted “America’s Favorite Historic Bar” in the National Trust for Historic Preservation’s 2016 Big Tap contest. Not long after that illustrious designation, on October 3, 2016, the Club Moderne was devastated by a structural fire. Though the fire destroyed much of the building, a remarkable number of historic features were spared damage. By the next morning, owners John and Stephanie Hekkel determined they would save the club if possible, and embarked on an effort to preserve all they could, and restore what was lost. The entire community rallied around the Hekkels, who invested over $200,000 to bring the building back. With funds from local development, the National Trust for Historic Preservation and insurance, the work was meticulously carried out by Dale Harris Construction, a skilled local craftsman. Dale refurbished the bar, rebuilt lighting and interior ceilings, restored the booths and reinstalled the glass Vitrolite panels on the exterior below the newly rebuilt roof. In 2017, the owners and community members celebrated the 80th anniversary of the club, with period costumes and a special thank you to all who helped raise it back from the ashes. We are pleased to honor this family for having the vision and commitment to bring the Club back to its former self, and restore this important legacy of Anaconda history for new generations of the community to proudly enjoy. Since the 1870s, the small ranching community of Helmville has come together every year in the production of its historic rodeo, which raises funds to support the community hall. Central to the rodeo is the historic rodeo grandstand, where generations have gathered to watch skilled riders in action and take part in a friendly competition. But after many years of use and abuse from wind, weather, and wear, the grandstand had deteriorated to the point where it was no longer safe to use – a problem that seriously threatened the historic identity and viability of the Helmville Rodeo Club. The Club’s Bill Baker and a team of Helmvillers set about fundraising, and talking to historic preservation experts, contractors, and materials suppliers to restore the grandstand. All in Helmville agreed that maintaining the historic integrity of the grandstand was a primary goal of the project. Support came from people all across Western Montana including individuals, families, nonprofits like the Montana History Foundation and MPA, businesses, and corporations. The Club’s $80,000 fundraising goal was quickly surpassed and within three months exceeded $100,000. One dinner alone netted $54,000. With funding secured, the grandstand was restored in time for 3,000 folks to converge on the 2017 Helmville rodeo. What began as a small town’s dilemma – trying to repair and preserve an historic structure and maintain a community tradition – became a symbol in a larger sense for the many rural communities working to protect and perpetuate their way of life. 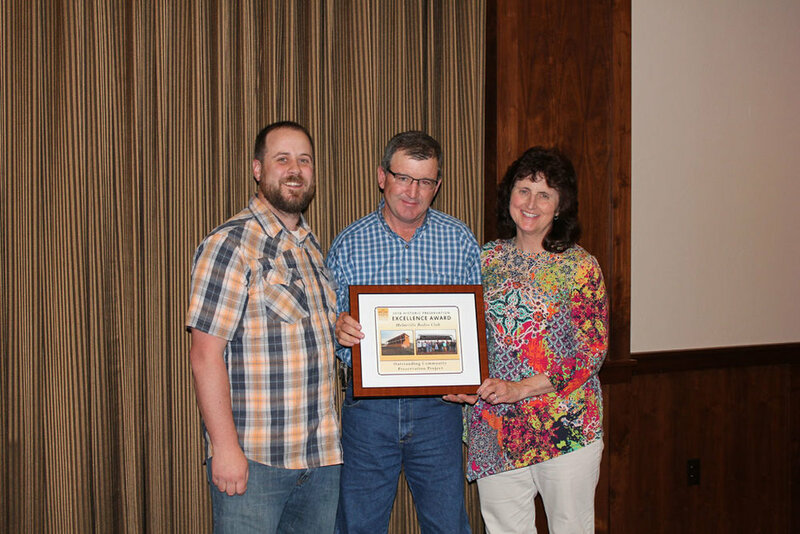 This award celebrates the efforts of Bill Baker, and all in Helmville and beyond, who helped breathe new life into the Helmville Rodeo Club. The downtown Bozeman community watched with anticipation as the 1890 Story Building was uncovered and returned to its original grandeur. Back in 1949, the Masonic Lodge stripped down the building’s facade to stay current with downtown storefront trends. After further remodeling in 1980 that covered all the windows, the Masonic Lodge became a faceless, unwelcoming building. In 2014, the Masonic Temple Board (MTI) undertook the huge task of uncovering the building to improve their lodge, and also create a welcoming space for community events. The project became part restoration on the Main St. façade where workers in 1949 and 1980 had left much of the brick, window hoods, and corbeled brick panels intact, and part rehabilitation for the side façade, where alterations over time had left little original material to work with. With so many layers of remodeling, the restoration and rehabilitation of each façade was often like solving a puzzle. CTA’s structural engineer worked closely with the contractor on site, revising the details as required. The Masonic Temple did not have to undertake this extensive rehabilitation. From the beginning, both the building committee and the Masonic Temple board encouraged design that would return their building to Main Street -- they wanted to support the historic character of their town, allowing people to enter and engage with it. The Masonic Temple and their members, invested in their future while investing in Bozeman’s future. Francis Auld, a Confederated Salish and Kootenai (CSKT) tribal member and Kootenai Elder, is a long-standing and highly respected member of Montana’s historic preservation community. His commitment to preserving the culture of the Kootenai people, and his dedication to forging positive, on-going relationships with state and federal agencies, archaeologists, and local communities are significant, lasting and immeasurable contributions to cultural resource preservation in Montana. In 1990, Francis began working as a Cultural Resource Specialist for the Kootenai Culture Committee and quickly became a steadfast representative of his culture in the face of overt racism, cultural prejudice and indifference. I In 1996, he became the Tribal Historic Preservation Officer or THPO. Francis willingly engaged with state and federal agency officials with determination, grace and humor at a time when tribal consultation was only beginning to be taken seriously by agencies. Throughout the 1990s, Francis formally participated in countless reviews of agency and tribal projects under the National Historic Preservation Act and other legislation. Building on the relationships established during his tenure on the Culture Committee, Francis and other THPO staff regularly met with agency archaeologists and land managers to review their annual work programs and identify issues and lands of tribal concern. During these consultations, Francis’ insights and humor helped to overcome occasionally contentious conversations about individual projects and issues. These discussions often centered on how best to preserve “intangible” (non-archaeological) resources, like landscape features associated with tribal place names and history. The CSKT THPO’s positive approach to tribal-agency consultation, guided greatly by Francis’s leadership, eventually became the model for other Montana tribes as their certified THPO programs came on-line. Since then, Francis has served as the Co-Director of the CSKT THPO program, and has been instrumental in developing the Tribal Preservation major at Salish Kootenai College in Pablo. As a spiritual leader, Francis continues to participate in the repatriation of Native skeletal remains, including the 2014 reburial of the ancient Anzick children. In May 2015, Francis returned to working for the Kootenai Culture Committee, where he administers the Kootenai Language Apprentice Program. He is currently mentoring five students in the ancient Kootenai language. Francis continues to play a vital role in Kootenai culture preservation and his views and opinions are still sought and well regarded today by archaeologists and historic preservation specialists in Montana, and on the adjacent Columbia Plateau and Northern Plains. Francis’ contributions to historic preservation in Montana are many and varied. As a tribal leader, educator, collaborator and communicator, we cannot imagine anyone more deserving of this prestigious Montana Preservation Alliance award than Mr. Francis L. Auld. Join wood restoration specialists from the Montana Preservation Alliance, U.S. Forest Service Historic Preservation Team, and Northwest Montana Forest Fire Lookout Association to learn the basics and finer details of restoring historic wood windows. This workshop is tailored for both homeowners and experienced carpenters. Pre-registration is required. $45 per person includes lunch at Cedar Creek Lodge. Register online or call 406-457-2822 for details. MPA in partnership with the USDA Forest Service Region 1 is excited to announce the next Montana Preservation Road Show, an historic preservation conference to be held June 13-16 at Cedar Creek Lodge in Columbia Falls and around the Flathead/Glacier region. The Road Show launches from a different small town every other year with the mission to immerse participants in the history and culture of rural Montana, spotlight great local preservation efforts, and raise awareness of the importance of preserving Montana’s historic buildings and cultural landscapes. Read more . . .
Start a family tradition and help perpetuate another 30 years of Montana preservation with MPA! Bring your friends and family, celebrate at our reception, and watch one of history's most beloved holiday AND preservation movies of all time! Join us for the opening of our Reimagine Montana art exhibit, enjoy a jazzy mid-century-style reception with music from Cottonwood Club, eat swanky hors d'ouevres from Hub Catering, and drink wine from the Hawthorn or fresh hot cider. Shop for the holidays for awesome art and travel at our silent auction table. Silent auction ends at 6:45 pm. Pay for your items before you go. Brief Annual Meeting & Raffle drawing! Watch It's A Wonderful Life on the Big Screen! Tickets on sale at the Myrna Loy Center box office or on the Myrna website. Jazzy Party and Movie: $20 per person; movie only, $12. Proceeds help save and protect historic MT places! We are so excited to announce the opening of our Reimagine Montana traveling art exhibit at the Myrna Loy Center in Helena. The exhibit opens on Dec. 12 and runs through Jan. 10. See more than 30 new works of art that reinterpret five of Montana's most historic places, including Virginia City, Travelers' Rest, Butte, the Upper Missouri River Breaks, and Glacier National Park. A reception and Anniversary Celebration is scheduled for 5:30 pm on December 12. See our Dec. 12 event description for more details. Admission to the Myrna Gallery is free and open to the public, Monday-Friday 12:00 - 7:00 pm; Saturday and Sunday 2:00 - 7:00 pm. Click here for full details of the exhibit, including a list of artists represented. We are so excited to announce the opening of our Reimagine Montana traveling art exhibit at the Bozeman Public Library. The exhibit opens on September 14 in concert with the Ivan Doig Symposium and will run through October 30, 2017. See more than 30 new works of art that reinterpret five of Montana's most historic places, including Virginia City, Travelers' Rest, Butte, the Upper Missouri River Breaks, and Glacier National Park. Admission is free and open to the public, Monday-Thursday 10:00 - 8:00; Friday 10:00 - 6:00; Saturday 10:00 - 5:00; and Sunday 1:00 - 5:00. Click here for full details of the exhibit, including a list of artists represented and exhibit dates/locations for the rest of 2017. We are so excited to announce the opening of our Reimagine Montana traveling art exhibit at the Holter Museum of Art in Helena. The exhibit opens on June 30 and will run through July 30, 2017. See more than 30 new works of art that reinterpret five of Montana's most historic places. Admission is free and open to the public, Tues to Saturday, 10:30 am to 5:30 pm; Sun., Noon to 4 pm. Click here for full details of the exhibit, including a list of artists represented and exhibit dates/locations for the rest of 2017. Join MPA staff, Board, and members and raise a glass for historic preservation! The Blackfoot will donate $1 for every pint sold. Beer really does work for preservation! This year the Montana Downtown Coalition conference will be hosted in Butte and coordinated by Mainstreet Uptown Butte with collaboration from the Butte Local Development Corporation, Butte-Silver Bow CVB with major support from the Butte TBID and the Butte Urban Revitalization Agency. The organizers are excited to welcome keynote speaker Laura Torchio, Deputy Director of Transportation Initiatives with Project for Public Spaces. Many schoolhouse owners dream of breathing new life into their building, but they just aren’t sure where to start or what to do next. This all-day workshop, funded by a grant from the Historic Preservation Education Fund, will address the basics of preserving small, rural schoolhouses. Using the wood-frame Unionville Schoolhouse south of Helena, and the stone Placer Schoolhouse in Broadwater County as case studies, this event will guide you through the process of assessing your schoolhouse, phasing and prioritization, addressing common problems, and finding resources for your restoration project. Attendees will also participate in a hands-on clean up activity at the Placer School. Lunch included. The workshop will be led by: Cathy Bickenheuser, US Forest Service Region 1 Preservation Crew Leader; and Dustin Kalanick, (AIA, NCARB, LEED AP BD+C), Restoration Director/Staff Architect fir the Montana Preservation Alliance. To register online visit our Workshop page or call 406-457-2822. Participants should meet at 8:45 am on Sept. 10 at MPA Headquarters, 120 Reeder's Alley, Helena. 2016 marks the 50th anniversary of the National Historic Preservation Act, the most visionary action in our nation’s history to protect our irreplaceable heritage. In honor of this milestone, MPA is planning a Preservation Road Show that will outshine them all. So, grab your walking shoes, hop on the tour bus, and join us next June in Red Lodge, Montana! Ride along with historians, authors, preservationists, archaeologists and tribal experts as we visit ancient rock art sites, historic trails, barns, churches, ranger stations, school houses, downtown storefronts, and more. The historic barns of Montana are a threatened part of our heritage. To capture their history and encourage their preservation, Chere Jiusto, Christine Brown and photographer Tom Ferris collaborated on the award-winning book Hand Raised: Historic Barns of Montana, released by Montana Historical Society Press in 2012. Chere Jiusto and Christine Brown have dedicated their careers to preserving Montana's historic places, as director and education director with the Montana Preservation Alliance. MPA championed this decade-long project, which traces the agricultural history of Big Sky Country and celebrates the craftsmanship that went into building these icons of rural life. This conversation includes an overview of Montana's barn-building history, stunning photographs of barns from across the state, and the stories attached to some of Montana's most memorable, photogenic, and historic barns.